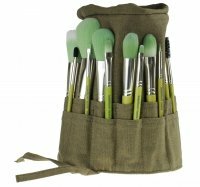 Green Bambu Series - Mixed Powder by Bdellium tools. The brush is designed for most cosmetics. It was made of soft synthetic bristles. Perfectly suited when applying loose or pressed powders, blushes and bronzers. Use it to create a perfect make-up every day. The bristle was put in a thick metal ferrule. The brush handle is made of bamboo, hard, sturdy and does not slide out of hand when working.